Deal between wildlife and trust lands officials to cost state taxpayers $1 million yearly, but does not resolve underlying clash pitting hunter access against school budgets. (Rick Egan | Tribune file photo) Deer roam in the Willow Creek area of the Book Cliffs, considered a prime hunting ground. State wildlife and school trust lands officials announced Monday they had settled a longstanding dispute over how much Utah's hunters and fishers should pay for accessing state-managed public lands. Hardly a week before Utah’s general-rifle hunting season opens Friday, state wildlife officials have reached a deal with the School and Institutional Trust Lands Administration to ensure hunters’ privilege to stalk big game on 3.4 million acres of state trust lands. The deal is set to cost taxpayers $1 million a year, but it avoids a potentially expensive court fight between the two state agencies that could be fraught with unanticipated consequences. For months, Division of Wildlife Resources officials have resisted SITLA’s claims that hunter access to its land holdings is worth big bucks. With backing from Utah Gov. Gary Herbert, wildlife officials have rejected demands for a huge spike in the already increasing sum sportsmen have been been paying for access to some of the state’s most coveted areas, such as the Book Cliffs and Tabby Mountain, which fall on a big block of trust lands. But last week the feuding agencies reached a “true” compromise, according to Mike Styler, director of the Department of Natural Resources, which oversees DWR. The dispute between the agencies focuses on whether trust lands are eligible to be administered as so-called “cooperative wildlife management units,” or CWMUs, an arrangement that allows property owners to sell hunting privileges as long as they manage their land to accommodate big game and public hunters who win access through a lottery. SITLA officials argue the agency’s holdings can be put into CWMUs. The federal government ceded some lands to Utah at statehood to be administered “in trust” for schools. They might be publicly owned, but trust lands are not managed for multiple use and public access as federal lands are. SITLA is obligated to optimize revenue from its land holdings and that means pursuing money-making arrangements regardless of what the public wants for these lands. A consultant identified 1 million acres of trust lands could work as CWMUs, a use for the land appraised at between $1.8 million and $3.9 million to SITLA. “We have strong market interest to lease our lands that would preclude public use hunting access,” Christy said. Under the renegotiated agreement with DWR, SILTA will not attempt to lease its lands for commercial hunting, while it receives a sum from hunters and taxpayers that reflects the revenue-generating potential of its lands. Under the deal, wildlife and trust lands officials’ disagreement will persist, but the school trust fund will be fattened by $1 million annually courtesy of a legislative appropriation that has to be renewed every year, according to Styler. “We appreciate DNR, DWR and the Utah Legislature for their efforts to preserve public hunter access while securing fair market value for the use of trust lands, which SITLA is constitutionally required to achieve,” said SITLA executive director David Ure. Under an old 10-year agreement that expired last month, sportsmens’ annual cost for accessing state trust lands rose by a fixed 5 percent annually, currently standing at $775,000. In the new deal, that ”inflationary adjustment” was lowered to 3.5 percent yearly, with the agreement effective for an additional five years. “We all agreed it was so painful to negotiate, we don’t want to do it again for another 15 years,” Styler said. 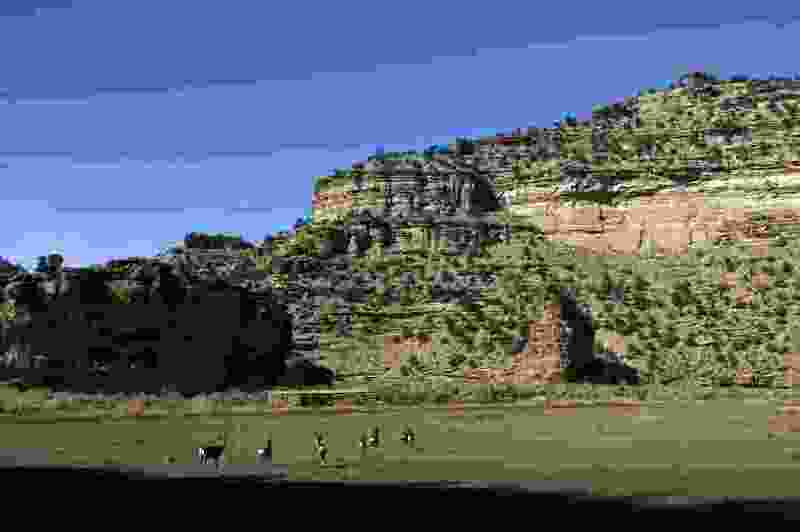 SITLA also gave a 20-year extension for two grazing permits DWR holds on 90,000 acres in the Book Cliffs along the Uintah-Grand county line. Instead of getting eaten by cattle, the forage will continue to be reserved for bison, elk and other game animals, which cost DWR $81,475 this year.